This image of the northern polar region of Saturn shows both the aurora and underlying atmosphere, seen at two different wavelengths of infrared light as captured by NASA’s Cassini spacecraft. 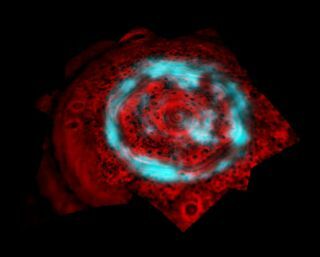 An inexplicable new broad region of auroral light has beenphotographed at Saturn's polar cap. "We've never seen an aurora like this elsewhere,"said Tom Stallard, an RCUK Academic Fellow working with Cassini data at theUniversity of Leicester. "It's not just a ring of aurorae like those we'veseen at Jupiter or Earth. This one covers an enormous area across the pole.Our current ideas on what forms Saturn's aurorae predict that this regionshould be empty, so finding such a bright one here is a fantasticsurprise." These colorful atmospheric light shows are caused whencharged particles stream along the magnetic field of a planet and into itsatmosphere. On Earth the charged particles come from the solar wind ? a streamof particles that emanates from the sun. Skywatchers at high latitudes know theresulting displays as the NorthernLights. Jupiter's main auroral ring, caused by interactions internalto Jupiter's magnetic environment, is constant in size. Saturn'smain aurora, which is caused by the solar wind, changes size dramaticallyas the wind varies. The newly observed aurora at Saturn, however, doesn't fitinto either category. "Saturn's unique auroral features are telling us thereis something special and unforeseen about this planet's magnetosphere and theway it interacts with the solar wind and the planet's atmosphere," saidNick Achilleos, a scientist on the Cassini magnetometer team at the UniversityCollege London. "Trying to explain its origin will no doubt lead us tophysics which uniquely operates in the environment of Saturn." The new image, in infrared, was imaged by the Cassinispacecraft. It is reported in the Nov. 13 issue of the journal Nature.